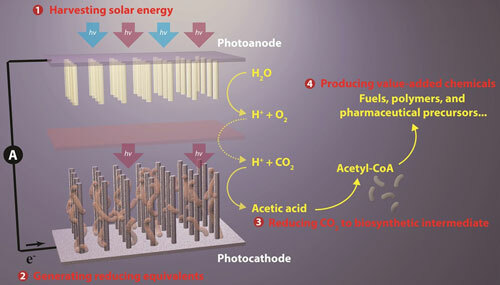 (Nanowerk News) A potentially game-changing breakthrough in artificial photosynthesis has been achieved with the development of a system that can capture carbon dioxide emissions before they are vented into the atmosphere and then, powered by solar energy, convert that carbon dioxide into valuable chemical products, including biodegradable plastics, pharmaceutical drugs and even liquid fuels. 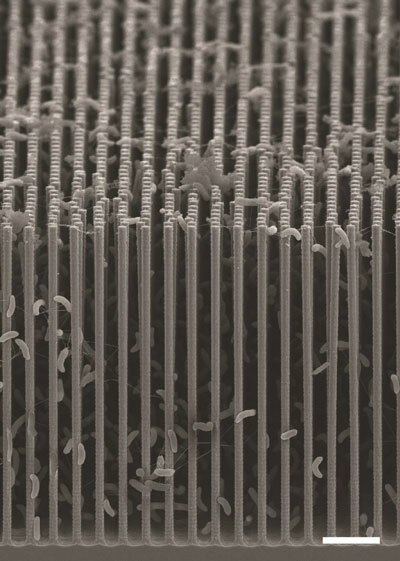 Scientists with the U.S. Department of Energy (DOE)'s Lawrence Berkeley National Laboratory (Berkeley Lab) and the University of California (UC) Berkeley have created a hybrid system of semiconducting nanowires and bacteria that mimics the natural photosynthetic process by which plants use the energy in sunlight to synthesize carbohydrates from carbon dioxide and water. However, this new artificial photosynthetic system synthesizes the combination of carbon dioxide and water into acetate, the most common building block today for biosynthesis. Yang, who also holds appointments with UC Berkeley and the Kavli Energy NanoSciences Institute (Kavli-ENSI) at Berkeley, is one of three corresponding authors of a paper describing this research in the journal Nano Letters ("Nanowire–Bacteria Hybrids for Unassisted Solar Carbon Dioxide Fixation to Value-Added Chemicals"). Once the carbon dioxide has been reduced by S. ovata to acetate (or some other biosynthetic intermediate), genetically engineered E.coli are used to synthesize targeted chemical products. To improve the yields of targeted chemical products, the S. ovata and E.coli were kept separate for this study. In the future, these two activities - catalyzing and synthesizing - could be combined into a single step process. The yields of target chemical molecules produced from the acetate were also encouraging - as high as 26-percent for butanol, a fuel comparable to gasoline, 25-percent for amorphadiene, a precursor to the antimaleria drug artemisinin, and 52-percent for the renewable and biodegradable plastic PHB. Improved performances are anticipated with further refinements of the technology.